Why do we have decorated Christmas trees? Where did they come from? In the 7th century a monk from Devonshire went to Germany to spread the Word of God. Legend has it he used the triangular shape of the fir tree to describe the Holy Trinity. Converts began to revere the Fir tree as God's Tree. By the 12th century it was being hung upside down from ceilings at Christmastime, as a symbol of Christianity. The first known decorated tree was in Latvia in 1510. Martin Luther, in the early 16th Century, is said to have decorated a small tree with candles to show his children how stars twinkled on Christmas eve. By the mid 16th Century, special Christmas markets in Germany were selling shaped gingerbread and wax ornaments for people to hang on their trees. Some early trees were made to symbolize the Paradise Tree in the Garden of Eden. Trees were often decorated with candy and paper flowers, symbols of plenty. The Christmas tree was brought to England by the Georgian kings, who came from Germany. The British people, not being fond of their German rulers, rarely followed the custom at the time. However, when the popular Queen Victoria married Prince Albert, a German, and they put up a tree for their family, Christmas trees became the instant fashion, not only in Britain but on the East Coast of America. The Christmas Tree had arrived! 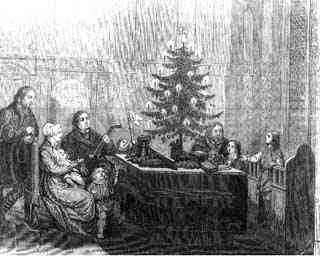 Although the Christmas tree had been introduced in America by Hessian soldiers during the American Revolution, the custom didn't catch on widely until the mid 1800s. Advances in communication--magazines, newspapers, etc., spread the custom. Most decorations at the time were homemade. Young women crocheted snowflakes and stars and sewed little pouches for gifts. Small bead decorations and silver tinsel came from Germany, along with angels for the top of the tree. Candles were often placed in wooden hoops for safety. About 1880 the first glass ornaments came to America, quickly followed by American patents for electric lights (1882) and metal hooks for hanging decorations (1892). Small artificial trees were fashioned from goose feathers for years. But the artificial tree as we know it came along in the early 1900s. In America, the Addis Brush Company created the first brush trees, using the same machinery that made their toilet brushes. 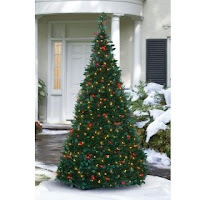 They were more durable than feather trees and would hold heavier decorations. Whatever kind of Christmas tree you have at your house, if any, I wish you a warm and happy holiday season.